Lorem connects businesses owners to a curated, professional network of freelance website developers and designers who can build or improve their website, blog or online store. Founded in 2017, Lorem is the only on-demand freelance marketplace that rigorously vets the experts on its platform and integrates with the most common software tools used by business owners on a daily basis. The online platform recently secured $2.5 million to expand its on-demand freelance marketplace. Lorem’s funding was led by Flybridge Capital Partners among other investors – including HubSpot, who will be including Lorem into its own marketplace for interested customers. Now that more than a third of the U.S. workforce alone is actively freelancing in some capacity, however over 50 percent of their time is spent trying to find new projects, rather than working and getting paid. Meanwhile, business owners are now juggling 15 to 20 different “do-it-yourself” SaaS tools to build and maintain their website, yet each tool requires more technical expertise to set up, customize and manage on a continual basis. 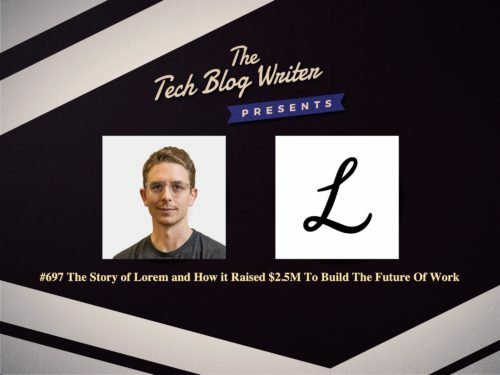 Lorem is attempting to solve these problems by automatically matching entrepreneurial business owners with high-quality freelancers to work on task-based projects at an affordable price. I invited Charlie Fogarty onto my daily tech podcast to learn more about his grand vision.